Inspection to determine areas of activity within a kitchen, room, apartment, or home. Physical removal of as many cockroaches as possible by vacuuming (when populations are significant). Application of Cryonite to cracks and voids where these insects are known or suspected. Application of void, crack & crevice and spot treatments with residual insecticides and/or cockroach baits. Working with the customer to correct conditions that promote or harbor cockroaches. Cryonite can be a useful tool in a German cockroach management program when combined with sanitary efforts and residual treatments. Cryonite is especially useful in sensitive situations where most conventional treatments cannot be used, such as hospitals, medical clinics, daycares, pet stores, and zoos. People and pets can remain in areas being treated with Cryonite though it is recommended treatment areas be vacated as often residual treatments will be made following Cryonite application. It is important to note that Cryonite is most effective on smaller insects. 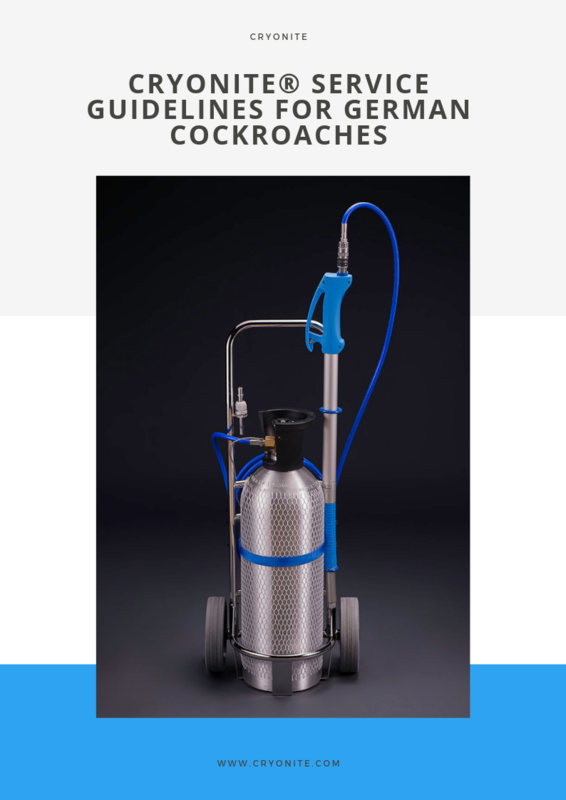 Properly applied, it will kill German cockroaches on contact but larger species, such as American or Oriental cockroaches, can survive an initial treatment with Cryonite. An application of Cryonite will flush and knockdown larger species, but additional applications of Cryonite may be need to ensure kill, or better yet, affected cockroaches can be removed by vacuuming after being chased from harborages and/or knocked down by an initial Cryonite application. Download our step-by-step guide for control of German cockroaches.